Jason Kenny and Simon Yates both won gold on a stunning day for Britain at the World Track Championships in Minsk. 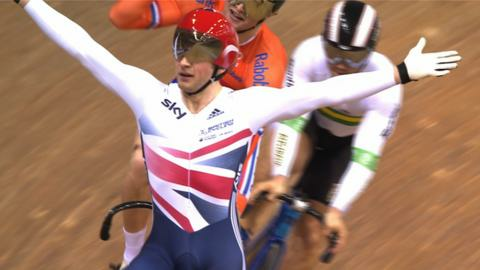 Kenny followed in Sir Chris Hoy's footsteps by taking the world keirin title with a sprint off the final bend. The Bolton rider had almost missed out on the final but was reinstated after French rider Francois Pervis was penalised in their qualifying race. Yates, 20, produced a terrific last-lap burst to win the 160-lap 40km points race in his first major competition. The twin triumph, which came in the space of 30 minutes on Friday evening, brings Britain's medal tally in Belarus to six, including three golds, and puts them above old rivals Australia at the top of the medal table after 12 of the 19 events. That sort of success seemed unlikely earlier in the day. Kenny had struggled to even reach the final, needing the repechage to get through the first round of the keirin and then relying on the relegation of Pervis to get through round two. After losing out for third place in a photo finish with Australia's Scott Sunderland, Kenny was sent through to the final after Pervis was judged to have cut into him. Once he was in the final, however, the 24-year-old three-time Olympic gold medallist rode the perfect race, squeezing through the six-man field on the penultimate lap and then powering past Maximilian Levy on the home straight. Kenny's previous world best in the keirin was the bronze he earned in Melbourne in 2012, when double Olympic champion Hoy collected his fourth world title. The Bolton rider has won a world title before but had never stood on top of a podium at a World Championships because his previous success, in the men's sprint, was handed to him retrospectively after Gregory Bauge was suspended. "It was unbelievable," Kenny told BBC Sport. "I put my hopes on Levy, saying I would stick to him and try and pass at the finish, which is how it worked out. I looked back and saw us all strung out like it was Chris Hoy leading us out. I still had a little bit to get through the finish. "I was suffering a crisis of confidence after coming sixth in the team sprint. But a bit of luck finally went my way and the final lap unfolded perfectly." For Yates, success was even more unexpected. He was making his debut at a senior World Championships and was given little chance of getting near the podium. But he also got his tactics spot on when it mattered, closing in on the riders above him by picking up points from sprints in the closing stages and then striking for the line on the last lap. Yates told BBC Sport: "That was absolutely brilliant. I've had perfect preparation and the race worked out perfectly. I was trying to conserve energy at the start and then the race came to me and I started getting involved with the sprints and then I realised I was only one point behind with the final sprint coming up." "I can't believe the way Simon Yates looked after his own resources and the confidence he showed. He didn't over-extend, but he took some risks. He plotted all moves and knew which were going to stay away and which weren't. It was such a clever and mature piece of riding. I thought he'd gone too far back in the field with two laps remaining. Coach Chris Newton was absolutely delighted with his charge, jumping in the air." There could be more British medals to come. Kenny starts out in the men's individual sprint on Saturday, but Becky James is already into the semi-finals of the women's equivalent after making faultless progress in winning all her races on Friday. James was fastest in qualifying and eased past Cuba's Lisandro Guerra Rodriguez and Australia's Kaarle McCulloch in the quarter-finals to reach the last four. The 21-year-old from Abergavenny has already won two bronze medals this week, in the team sprint and 500m time trial, but she will go for gold if she beats China's Shuang Guo in the next round. Elsewhere, Dani King, part of Britain's triumphant women's team pursuit trio, finished sixth in the 10km scratch race. And another young rider, 19-year-old Jon Dibben lies 11th at the halfway mark of the six-discipline omnium.